This is so cute and colorful. I love all the accessories that come with it. It makes for a more realistic play. It is perfect for the American Doll but can also be used for non American Dolls that are around 18 inches tall. The plastic is very durable but super light. 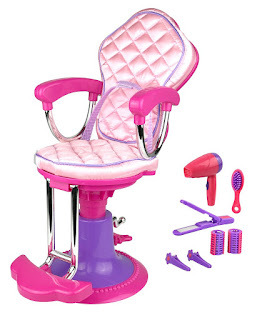 The chair is like a real salon, where you it goes up and down. The base can be a little unsteady, so I would suggest playing on a solid floor of some kind. It is super easy to put it together. It only took a few minutes and it was ready for play. I really like the upholstered seat and back. Besides the chair going up and down, the foot rest can flip up or down. It is adorable.